Scottish Power has won "tens of millions of pounds" in government funding to develop new technology to tackle climate change. The company's scientists are among the leaders in an international race to find ways of reducing carbon emissions from power stations. CCS technology (carbon capture and storage) would remove carbon dioxide produced by the coal-fired station. This would then be turned into liquid using chemicals and stored underground. Officials said emissions could be cut by as much as 50%. 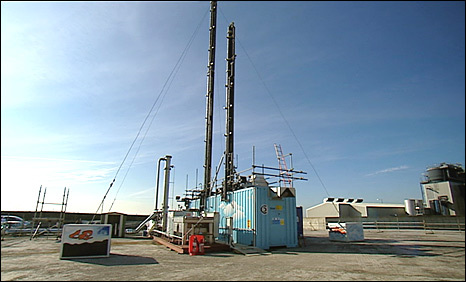 A trial CCS unit has already been built at Longannet and scientists said it has been "performing well". Environmental campaigners believe the technology is vital and believe Longannet is leading the way. Longannet will now compete with E.ON's plant at Kingsnorth in Kent for £1bn of government funding to build a massive new carbon capture and storage facility. Tony Corless, Scottish Power's carbon capture technical storage manager, said: "What we have is a small carbon capture plant at Longannet and within that plant we have a special chemical, which attacks and attracts the carbon dioxide within the power station. "It is then compressed and put down pipelines or into ships and sent to the North Sea to gas reserves where we can store the carbon dioxide deep underground." Dan Barlow, WWF Scotland's head of policy, said: "The power station is responsible for a third of Scotland's emissions so it is essential that we decarbonise it. "Energy renewables have a massive role to play but we also need to use carbon capture technology and that's why it is essential we work out how to do this and how to develop this technology and apply it to all the plants that exist."